- Journalistic investigation: A Company of Two. Secret Orders for Defence Industry Became a Gold Mine for Authorities. In order to attract investments, Ukrainian authorities have to make the extraction market as transparent as possible and open for fair competition. However, AntAC report suggests that the market is not open for real foreign investors and is shared between political cronies and oligarchs, sometimes with close ties to Russia. Authors of this report are analysts and lawyers of the AntAC. During five months in 2017-2018 authors of the report conducted the open-source search for real beneficial owners of private companies owning special permits for development of oil and gas fields of Ukraine. Text of the report. New dubious initiative, pushed forward by the National Agency for Corruption Prevention: they prepared a draft law that allows all the law enforcement officers assigned to the Anti-Terrorist Operation zone not to submit their declarations. 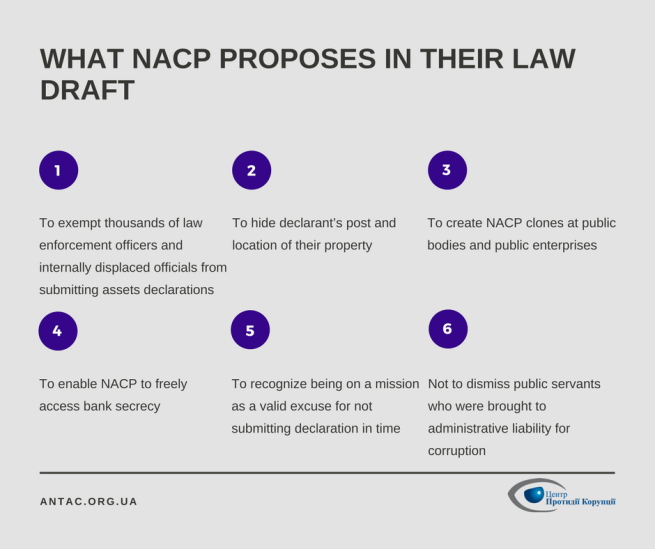 The NACP also proposes to hide information about a city/village name where a declarant owns real estate, and a lot of other information currently available to the general public. We explain how this might harm e-declarations reform. 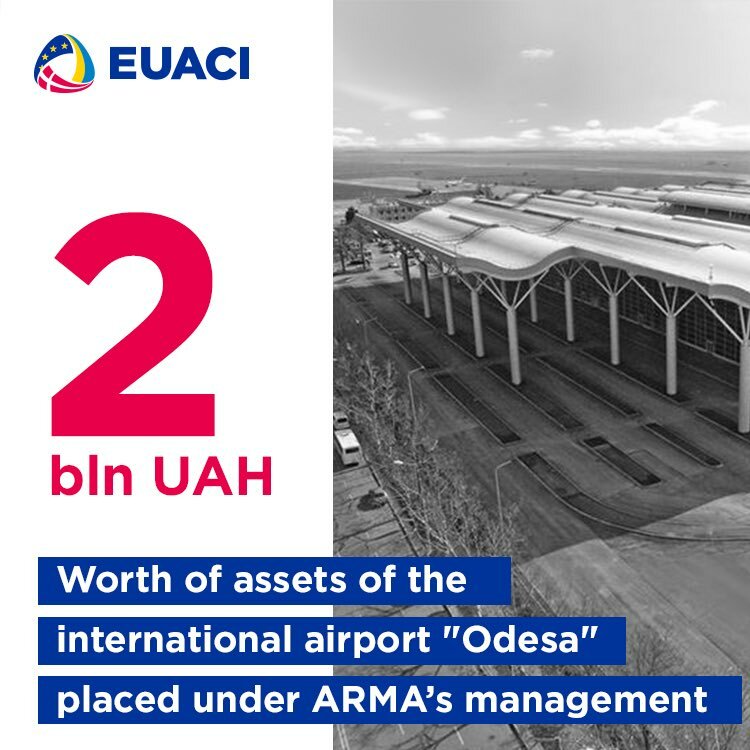 The Asset Recovery and Management Agency received for management the immovable property of the international airport “Odesa” and 75% of shares of the company which owns the airport, worth 2 billion UAH (approximately 77 million USD). 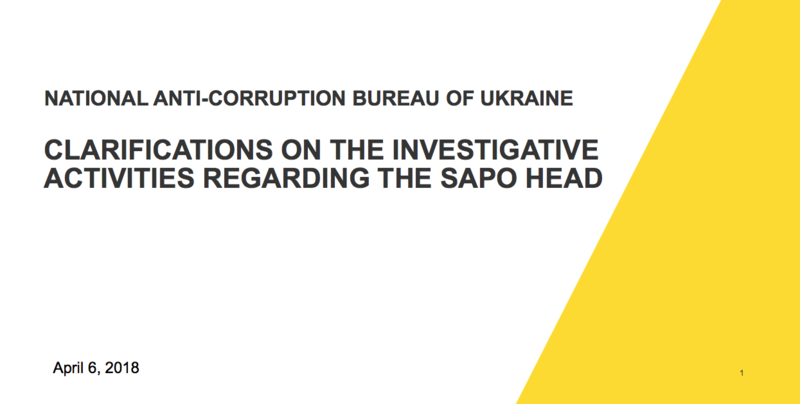 Following the request submitted by NABU and SAPO, the decision to arrest the assets and transfer them to the ARMA was made by an investigative judge of the Solomyanskyi district court of Kyiv on March 29, 2018. More details. In May 2015 Olena Arkusha, wife of Kirovohrad oblast chief of the Security Service of Ukraine Oleh Arkusha, created firm “Elstrade s.r.o.”, registered, like so many others, in Žilina, Slovakia. 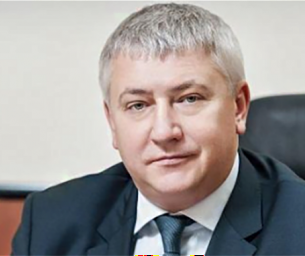 Soon another firm became a co-owner, which is connected with Pavlo Petrenko, Minister of Justice as well as the foreign lawyer whose services were used by Colombia drug cartels and North Korea government. The offshore novices soon left the company, but not before leaving 620 thousand of the authorized capital of Slovak firm for the Security Service officer’s wife, as they never took the money back. Thus Olena Arkusha found herself an owner of a foreign firm with over 600 thousand EUR. More details. In the meantime, we would like to remind that the Security Service of Ukraine managing officials disregarding the requirement of the law do not submit their e-declarations. In February at the Munich Security Conference President Poroshenko proudly told that Ukraine spends nearly 6% of the GDP, that is 179 billion UAH on defence. What he did not talk about is that about 20% of the Ministry of Defence Budget – which is 83.3 billion UAH as of 2018 – goes toward secret procurements. This sum is more than just large according the world standards, but what is more, these contracts, kept secret from the general public, became a sphere where suspicious financial deals run galore. And high-ranking officials from the President’s team and parliament coalition are involved in it. Full text. On April 12, Novoe Vremya editor-in-chief Vitaliy Sych posted on Facebook that after the article was published they received legal threats and demands for rebuttal from certain entities mentioned in the text. 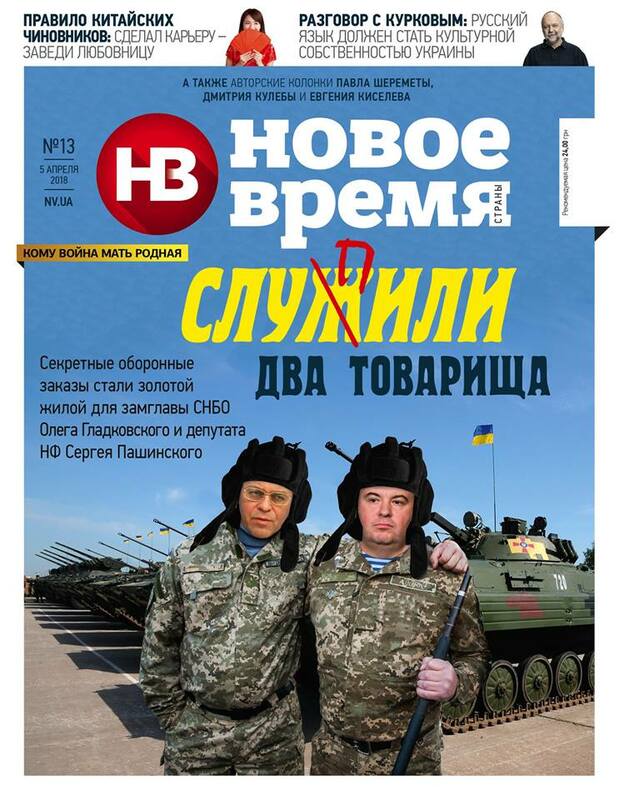 On April 13, lawyers of Narodnyi Front MP Pashynskyi (one of the figurants of the article) came to NV office and claimed that people from the Ministry of Defence and Pashynskyi's allies want to 'tear up' NV, but yet there is another way forward, a so-called 'peaceful settlement': publication of Pashynskyi's rebuttal in the magazine. The lawyers even brought MP's picture to be placed on the magazine's front-page. They also gave Sych Pashynskyi's phone number and offered to call him and establish a direct 'human' contact. Full text of Sych's post (in Ukrainian). Copyright © *2018* Anti-corruption Action Centre*, All rights reserved.